Washington Monthly | Are Bushes Actually Better? Yesterday, Jonathan Bernstein noted that Jeb Bush’s presidential campaign may be having significant problems, then added that he never really understood why Republicans hold this family in such high esteem. As I noted last week, Republicans tend to win when they run Bushes and tend to lose when they don’t, but do we have any evidence that they’re particularly gifted as politicians? We have four general presidential elections in which Bushes have run: 1988, 1992, 2000, and 2004. They won three out of those four, so that’s not nothing. (They’re five for six if you count the times when Bushes were vice presidential candidates.) And GOP consultants will tell you amazing stories about how George H.W. Bush was trailing Mike Dukakis in the summer of 1988 until the former crushed the latter with a tenacious advertising campaign. They’ll also tell you that Al Gore should have destroyed George W. Bush in 2000 given the popularity of Bill Clinton, but Bush eked out a victory due to his great campaigning skills. But of course we know that the economy is a very strong predictor of how presidential elections will go. So the best thing to do is see how Bushes do given how the economy was doing. 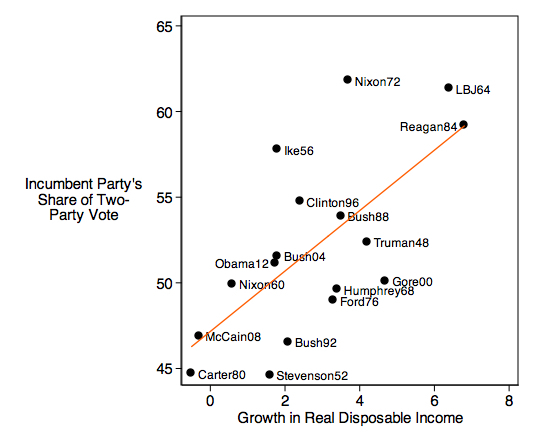 The scatterplot below shows how the incumbent party’s presidential candidate has done in every election since 1948, compared against growth in real disposable income over the prior year. Two of those elections — 1988 and 2004 — are basically right on the line. That is, each Bush did almost exactly as well as we’d expect given how the economy was doing. The two others are a mixed bag. GHWB massively underperformed in 1992; the economy had already started recovering from the 1991 recession but Bush was not able to capitalize on that. And Gore significantly underperformed in 2000, meaning that GWB did substantially better than we’d expect given economic growth. So we have two elections in which Bushes do no better or worse than we’d expect, one in which they underperform, and one in which they overperform. On average, they do about as well as any other presidential candidates. So if there’s some hold the Bushes have over the imaginations of Republican party activists, that’s largely the product of consultant folklore. In reality, they’re no better or worse than anyone else.